The Zeiss Contax was arguably the best 35mm rangefinder made before WWII, with a larger range of faster and sharper lenses than Leica. Many considered the pre-war Contax the "professional" 35mm camera, while the Leica was for amateurs. While Leica remained relatively intact after the war, Zeiss postwar recovery was made infinitely harder by being split into two separate competing West and East German companies. 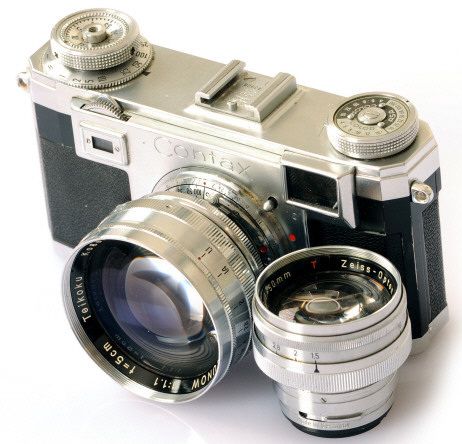 After W.W.II West German Zeiss introduced the modernized Contax IIa and IIIa in 1950. Compared to the prewar Contax II and III (without and with meter), the IIa and IIIa used the same lens mount with a completely re-engineered shutter mechanism, new body, and much improved chrome finish. Many believe the post war cameras are more dependable, but others will argue the point. Contax offered a complete system approach, including a broad range of lenses, viewfinders and close-up devices. Competing against the likes of the postwar Leica IIIf, Nikon S, and Canon IV, the Contax IIa and IIIa were very competitive designs in 1950. The Contax IIa and IIIa were beautifully made cameras -- many will argue better finished and with sharper lenses than even the legendary Leica M3. Unfortunately for Contax, their competitors improved with time and Contax didn't. When discontinued in 1961, the Contax bodies was totally outclassed in features by the likes of the Leica M3, Nikon SP and Canon 7. A number of interesting prototypes were made and shown at various shows, but their improvements never made it to production. Although sales figures are unknown, apparently sales were not sufficient for Zeiss to invest in updating the Contax, as Zeiss allowed their star Rangefinder to be killed by the new improved features of its competition. Smaller body: A II body weighs 21oz and measures 3 3/8"x 1 11/16"x 5 1/2." A IIa body weighs 18oz and measures 3 1/16"x 1 11/16" x 5 5/16." Side by side, a IIa looks about 20% smaller than a II, though the weight difference is only 3 oz. 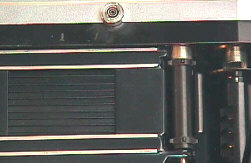 Improved Shutter: the cloth connecting straps of the II / III shutter curtains were replaced with gears. Painted Aluminum slats replaced the brass shutter slats of the II / III. 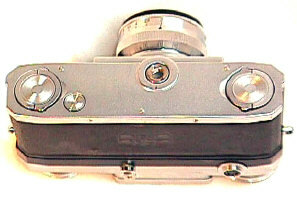 The simplification of the shutter also resulted in fewer parts, and some believe great reliability -- although this is often a point of dispute. The IIa / IIIa shutter sequence is T, B, 1, 2, 5, 10, 25, 50, 100, 250, 500, 1250. T and 1 are additions compared to the II / III. Much improved chrome finish and quality of machining: The II / III were not badly finished cameras, the IIa/IIIa are just remarkably finished cameras with jewel like precision still evident in near mint examples. Flash Sync added: Black Dial Contax require special Zeiss flash cords for either flash bulbs or electronic flash. 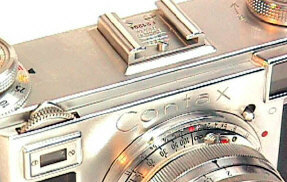 The Color Dial Contax introduced a standard PC connection. Flash sync was 1/50th. Shutter speed dial moved from the advance knob to a separate and much easier to use shutter dial, concentric to the advance knob. 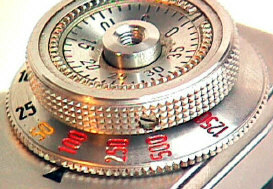 You lift the dial and rotate it to the desired shutter speed, whether the film is advanced or not. This was not only much faster than changing speeds on the previous II / III, it also made checking the set speed much easier and faster. While the previous II / III could change shutter speeds whether the shutter was wound or released, it could not change speeds if the shutter was only partially wound, which the IIa / IIIa can. Rangefinder length reduced from a gargantuan 90mm to 73mm: still 15% longer than the Leica M3's rangefinder base length. Magnification reduced to about .66, for an effective base length of approximately 48mm, just slightly less than the standard Leica M .72 finder used in today's M6. The rangefinder was also simplified cheapened), which means it can go out of vertical or horizontal alignment, something practically impossible with the II / III rangefinder. In practical terms, the IIa and IIIa were modified and improved versions of the pre-war II and III. Notable improvements on the same basic design were a new smaller body, flash sync, much improved chrome and machining, and some say a more reliable shutter. The shutter on a well adjusted IIa and IIIa are very quiet, almost as quiet as a Leica M. The chrome and leather of the post-war Contax IIa and IIIa was much better than the pre-war Contax II and III. The IIa and IIIa were basically the same camera, except the IIa had no meter and the IIIa had a bulky selenium meter. Generally the IIa is more popular and sells for more than the bulkier IIIa. The IIIa selenium cell is usually dead and the uncoupled (to either the shutter or the lenses) makes for awkward time consuming use. Worse, a working IIIa meter is probably not going to be accurate because the selenium cell is slowing losing its response to light. Finding anyone with replacement selenium cells is not easy. Notice the wide spaced rangefinder/viewfinder windows. Contax had the longest rangefinder base of any of the classic Big Four rangefinder systems (Leica, Contax, Nikon, Canon) -- translation: the most accurate. Zeiss also used an expensive optical rangefinder arrangement which could not go out of alignment. Like the prewar II / III, the IIa / IIIa used a combined rangefinder/viewfinder window. Unfortunately, it was not particularly bright and had no built in brightline frames or parallax correction. Notice the shutter speed dial. 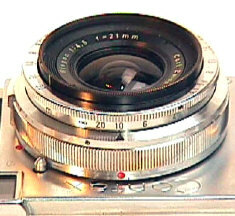 The IIa and IIIa separated the shutter speed dial from the advance knob, so it was easier and faster than previous Contax to change shutter speeds. Also notice the red and yellow shutter speeds in the pic, on a "Color Dial" version introduced in 1954. Earlier version IIa and IIIa cameras had all the shutter speeds in black, and were called, would you believe, "Black Dials." Even though the Color Dials were in production longer than the Black Dials, 1954-62 vs. 1950-54, Color Dials were produced in few total numbers and are harder to find, in my experience to a ratio of about 3-1 on the West Coast on the US where I am based. The earlier "black dial" IIa and IIIa have a peculiar flash sync connection which is a real pain. Not only do you have to use a special Zeiss plug, you also have to use different connectors for flash bulbs(1361) or electronic flash(1366)! Today these little connectors are hard to find, and worth about $50 in mint condition. The later "color dial" IIa / IIIa had the incredible improvement of a standard PC connection. They are recognizable by the PC, or by the red colored high speeds (shown above). Look closely on the shutter speed dial. That's right, it does say 1/1250th. Not much faster than Leica's 1/1000th, but still faster to provide a bragging point in the great "Leica Contax" debate. See that little wheel near the shutter speed dial? That's the focusing wheel which allowed focusing of the normals and wide angles with the index finger. Behind the focusing wheel is the infinity lock -- push it down to release the lock. The focusing mount is quite interesting because the focusing helical for the 50mm lenses is built into the body rather than the lens. This design has the benefit of making very small 50mm lenses, but had the disadvantage of what some say is an overly complicated mount. The inside mount is for 50mm lenses, whiles the outside bayonet is for wides and Teles. In use I don't consider it any more trouble prone than the Leica system, since any focusing mount whether it is in the lens or the body can still tighten up and need re-lubrication. While the Contax shutters are much more complicated than Leica shutters, they about equal in service, with a tradeoff of features. 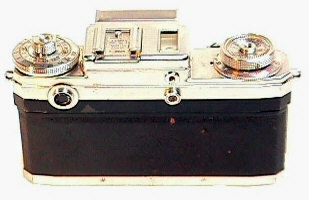 The post war Contax continued their pre-war shutter tradition, with vertically traveling metal shutter curtains. Both Leica M and Contax IIa / IIIa shutters are relatively dependable. On both, slow and inoperative slow speeds are usually the first thing to give trouble. Both shutter designs show the need of a cleaning by inoperative slow speeds. It is not unusual to replace the Leica's cloth shutter curtains -- something that is practically never done with the Contax metal shutter. Zeiss aficionados usually insist that Zeiss makes the best lenses...bar none. While the bodies may have lagged behind their competitors, Contax lenses were absolute world class. Zeiss and Leica lenses have a different look to the shots, the easiest way for you to understand it is to shoot with both yourself. All post war Contax lenses are coated. 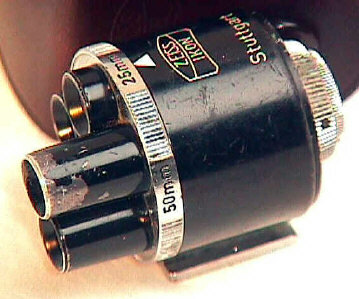 Earlier West German lenses are engraved "Zeiss Opton," later lenses "Carl Zeiss." East German lenses are labeled Jena and are "T" coated. The West German lenses have noticeably better workmanship and finish -- and sell for more. All West post war lenses from 21 to 135 have nicely finished chrome barrels. The East German 25 to 135 Jena lenses are typically mounted in not so well finished aluminum barrels. The more expensive black 180 to 500 Jena reflex housing lenses were noticeably better finished. Early Contax lenses for the early 1930's Contax I have black trim. To make things MORE complicated for the Contax lover, the 180 and longer lenses sold in West German Contax catalogs were EAST German lenses (with their Jena engravings) ! East German 50's were sometimes sold with West German bodies in order to lower the selling price. It seems East met West quite often in Contax land. Russian lenses made for the various Kiev Contax copies offer the lowest priced lenses for your Contax. They are mostly copies of pre-war Zeiss designs. While quality can be inconsistent, the better ones are capable of fine performance. The first two digits of the serial numbers indicate the year of production. So far as I know there is complete interchangeability, except for the Russian 35/2.8 which has too large a rear element to fit on the post war IIa and IIIa. 35mm f/2.8 Biogon, West and East. Post war West German lens with new optical formula has outstanding reputation. East Post War lens was a coated version of the pre-war formula. Also made in uncoated pre-war version. Note: 35 Biogons with the pre-war formula do not fit the Contax IIa and IIIa, but the post war West German 35's will fit either pre-war or postwar cameras. 50mm f/3.5 Tessar, West and East. collapsible and rigid versions East versions. Rigid West version rare. Also made in uncoated pre-war Jena version. 50mm f/2 Sonnar, West and East, excellent reputation. Also made in uncoated pre-war Jena version (black or chrome). West German version has nicely finished chrome barrel, East German version has OK finish aluminum barrel. West German post war versions include: chrome nose with "Zeiss-Opton" engraving, black nose with "Zeiss-Opton" engraving, black nose with "Carl Zeiss" engraving. 50mm f/1.5 Sonnar, West and East, outstanding reputation. The 50/1.5 Sonnar is generally considered one of the best normal lenses ever. It is one of the few examples of a faster lens generally outperforming its slower f/2 counterpart. Also made in uncoated pre-war Jena version (black or chrome). West German version has nicely finished chrome barrel, East German version has OK finish aluminum barrel. West German post war versions include: chrome nose with "Zeiss-Opton" engraving, black nose with "Zeiss-Opton" engraving, black nose with "Carl Zeiss" engraving. 85mm f/2 Sonnar, West and East, outstanding reputation. Also made in uncoated pre-war Jena version (black or chrome). 85mm f/4 Triotar, West, low priced portrait lens with so reputation. 135mm f/4 Sonnar, outstanding reputation. Made in pre-war uncoated Jena version (black for the Contax 1, chrome for the Contax II & III), coated West German Zeiss Opton or Carl Zeiss version, and coated post war East German Jena version. 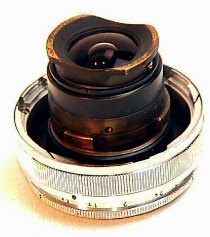 Leading the way of Contax lens design was the legendary 21/4.5 Zeiss Biogon. It was, and is, an amazing lens. When introduced in 1954, there was literally no other super wide competitors. See Profile. West German Contax Zeiss Turret finder. The finder rotates to give different views. Depending upon version, the widest lens was either 21, 25 or 28, combined with finders for the 50, 85, and 135. Parallax correction at rear. A wide variety of other finders were also made. Do you notice a similarity between the Contax and Nikon Rangefinders? Nikon copied much of the Contax concept in their Nikon One. ALMOST the same mount. Although very similar, there is a very slight difference in back focus and helical turning rates. The wides between both systems will interchange easily. The longer you go over 35, the more accuracy focusing problems you encounter. Since the wide angles easily interchange, a combination Contax and Nikon Rangefinder outfit is not a bad idea. Nikon opted for the simpler and less expensive Leica type shutter and rangefinder. Frankly, after the war Nikon probably didn't have the industrial capacity to built Zeiss type shutters and rangefinders. See Profile. Working Condition: the advance wind and focusing should be smooth and easy. If they are not, you know the camera will need servicing -- something to probably expect anyway on a 40 year old camera. If the meter on the IIIa works, great, but if not, no big deal. Even if the meter works, its doubtful if it will accurate. Shutter: take the camera back off, and hold the camera towards a light as you watch the shutter at all speeds. If the shutter needs an overhaul, the slow speeds are most likely to hang up, while the high speeds will probably still be working. Make sure the shutter actually opens on the high speeds. Sometimes the Contax shutter will seem to work on the high speeds, but both curtains will not engage -- so no exposure actually takes place. With an improved shutter over the previous Contax, the IIa / IIIa do not have the infamous cloth shutter straps which can break, turning the camera into a nice doorstop until they are fixed. Nevertheless, Contax IIa/IIIa shutter jobs are expensive and few repair people work on them. Zeiss Bumps: It is not unusual to find corrosion underneath the body leather, creating what are unloving called "Zeiss Bumps." Although some fixes can be tried, I have never yet seen it done perfectly. Film Take-up Spool: All manual focus Contax rangefinders have easily removable film take up spools. In fact, they are a bit too easily removable, as they are often lost. Yes you can eventually find a replacement, but be aware that the camera is indeed supposed to have a film take-up spool. Lenses: shine a light though each end of the lens, to see if there is any fogging, lens fungus, or lens coating scratches. Fogging can be cleaned. Lens fungus can sometimes be cleaned, sometimes it can not. If the scratches are small, they probably won't effect the pictures very much. A lot of scratches will probably have an effect, and unless its an expensive lens, having it recoating is a waste of money. Aperture rings should turn smoothly and easily without binding. Helical focusing on the wides and telephotos should be smooth and easy, if not, the lens needs servicing. Ask the seller for accessory finders, lens caps and shades if they have them, since they can be difficult to find. Viewfinder/Rangefinder: The Contax finders are dim compared to the Leica M's, but the RF focusing patch is much brighter than the background. Unlike Leica's, it is a very rare Contax that does not have its rangefinder in perfect vertical and horizontal alignment at infinity. If the camera should need rangefinder adjustment, avoid it or get a low price. Hold the camera up about a foot away from you, and look through the finder and rangefinder system from both sides. A healthy finder will show only clear glass. If you see partial blackening at the finder edges, or signs of discoloration in the finder, it is a sign of finder deterioration. If the condition is not too bad, you can probably live with it. Be aware though, that the only place you will get a replacement finder is from another Contax body. As a shooter: You might consider replacing the smooth Contax body covering with a more grip able surface like the Leica M6 material. Another upgrade is replacing the Black Dial flash terminal with a standard PC connection, if and when you are having the camera overhauled. IF the camera is not working at all and needs a shutter overhaul, don't spend the repair money on a worn camera. Investing overhaul money into a worn Contax IIa / IIIa is not worth it financially, unless it has sentimental value to you. This is also true of the earlier I, II, III. Too Many Warnings? If all of these things to look out for seem too much, remember the IIa / IIIa are old enough to be grandfathers, and that other classic rangefinders have just as many things to look out for when you are buying them. Lastly, remember the IIa/IIIa is made just as well if not better than the Leica M3, while at the same time selling for MUCH less than its Leica M and Nikon Rangefinder brethren ! Personally I prefer the IIa / IIIa over any of the previous Contax in terms of convenient shooters, though I still have to confess RF and Shutter envy for the Contax II / III's magnificent engineering. Contax IIa and IIIa Rangefinders are very under priced in today's collector's market compared to the likes of the Leica M3, Nikon SP, and Canon 7sZ. If you value incredible workmanship and sharp lenses, the Contax IIa / IIIa are well worth considering. Be prepared to search long and hard for all the lenses and accessories, however -- they are hard to find. The later Color Dial versions are rarer and more in demand by collectors, often selling for twice as much as the Black Dials in the US and Japan. The earlier Black Dial cameras with the funny flash connectors are the best buy for users. 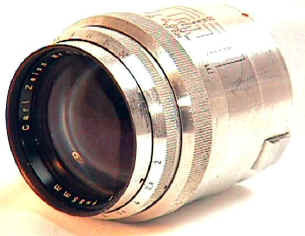 Russian made lenses for their post war copy of the pre-war Contax II, called the Kiev, also provide a budget priced lens source. Strangely enough, until the new Voigtlander Bessa RC arrived with TTL metering arrived at Photokina 2002, the most advanced Contax RF to see the light at the end of the production line was the Soviet made Kiev 5, produced from about 1967 to 1973. 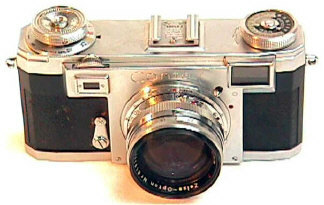 It has a shutter coupled selenium meter, lever advance, the largest eyepiece in a classic Contax camera, a nifty lever rewind built into the side of the camera, and wonder of wonders, a projected non-parallax corrected brightline finder, complete with Contax outer bayonet mount and Contax type vertical metal shutter. The 5 did not use the internal helical for 50's, having its own special 50 with a built in helical. The other Contax mount wides and Teles will fit it, even if regular Contax normals do not. Some believe the Kiev 5 was influenced by West German Zeiss prototypes which never made it to regular production. Alas, the Kiev 5 is hard to find, and not particularly well made -- or reliable. The lever film advance is a weak point. If you want one as a reliable shooter, think again. To date the ONLY classic Zeiss Contax mount rangefinder mount camera with TTL metering EVER sold to the public is the Cosina made in Japan Voigtlander R2C. Not content with just a new camera body without new lenses, Cosina's CEO Mr. Kobayashi also produces a new line of modern optics with multi-coating. While the SC Voigtlander 21/4, 25/4, 28/3.5, and 35/2.5 lenses are technically are made to Nikon Rangefinder mount specifications, real world shooters found out long ago the wide angle lenses between the two systems could be interchanged. Using the Voigtlander FS adapter, dedicated Contax RF shooters can also use the Voigtlander SL 12/5.6 and 15/4.5 -- the widest lenses ever for their classic Contax. With the new line of Voigtlander wides and even a TTL metering Contax mount camera, Contax fans have more options now than ever -- amazingly enough four decades after the classic Zeiss Contax was officially discontinued by Zeiss. The fabulous Japanese made Zunow 50/1.1 mounted on a Contax IIa with a 50/1.5 Sonnar. Revised: September 13, 2017 . Copyright � 1998-2003 Stephen Gandy. All rights reserved. This means you may NOT copy and re-use the text or the pictures in ANY other internet or printed publication of ANY kind. Information in this document is subject to change without notice. Other products and companies referred to herein are trademarks or registered trademarks of their respective companies or mark holders.